Here we have 4 tins, the top to are connected to each other electrically, and the bottom two are insulated. There are two pipes coming from the top tins. There are two metal rings around the ends of the pipes and the right hand ring is attached to the left hand tin and vice versa. Watch what happens when the water is turned on. As the water drips down one of the bottom tins becomes positive and the other negative with a voltage difference of probably over 1000v. This means that any small droplets are deflected by the electric fields and go on crazy paths. Why does it charge up? This is the beautifully elegant bit. If one tin happens to randomly become slightly positive that means that the opposite ring will also become slightly positive. Electrons in the water are attracted by the positive ring, so the drops which are just forming in this ring become negative and then fall into the pot below. This pot then becomes negative, and therefore the opposite ring also becomes negative. So the drops forming become positive. These fall into the left hand pot making it more positively charged. This effect will keep getting stronger and stronger until the voltage builds up enough for charge to leak away in the air, or sparks form. 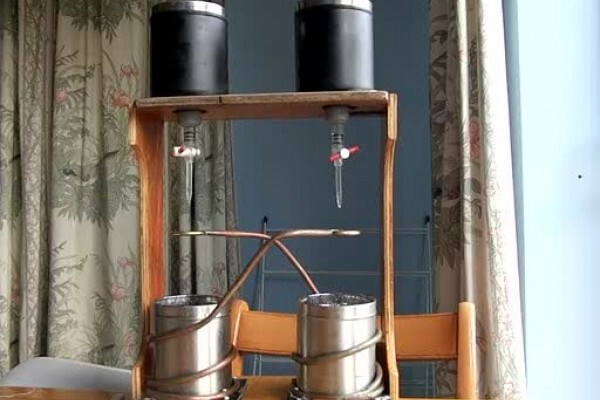 The experiment will work just as well with couple of tin cans, some wire and some rubber tubing, as long as you get the electrical connections right.